clay and limestone: What's wrong with Goldenrod? 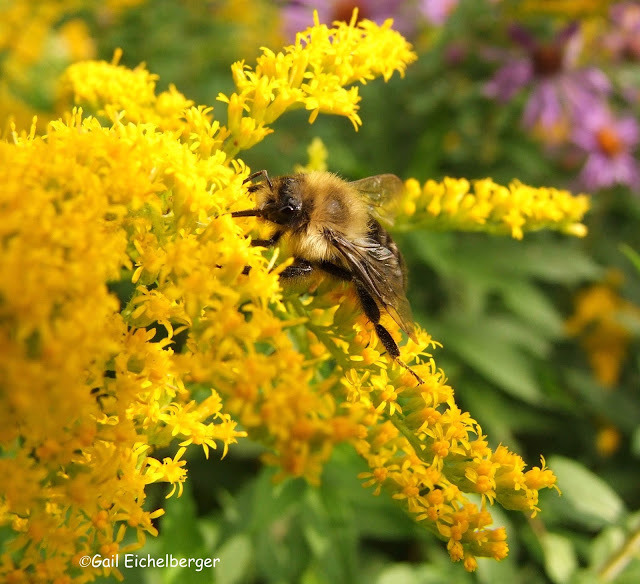 Goldenrods put on a beautiful flower show in early autumn and any insect that needs pollen and nectar is sure to be found visiting. That's why I refer to them as landing pads of deliciousness. Let's get the objections over with first! Goldenrods have a bad reputation for two reasons. *They have been misidentified as the cause of hayfever suffering. They are not responsible for any allergy symptoms you or I are having this fall. The tiny grains of wind blown pollen from ragweed is the culprit. 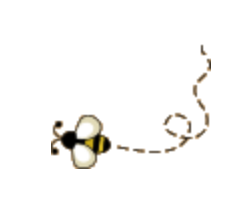 Goldenrod is insect pollinated and the pollen grains are too big to be blown about. Pass that along please! *They can be aggressive spreaders. Goldenrods are rugged and adaptable. They grow were many wildflowers cannot survive and they can spread quickly where there is no other native plant competition. Those that have been problematic propagate by a rhizomatous/spreading root system that can quickly take over a small garden. If you want to plant them, but fear their nature, look for clump forming cultivated beauties like Solidago 'Solar Cascade', Solidago caesia/Bluestem Goldenrod, Solidago odora, Solidago rugosa 'Fireworks'. My favorite clump former for shade is Solidago flexicaulis/Zigzag Goldenrod. Long time readers know I have a love affair with rough and tumble, take care of themselves, colonizing wildflowers. If you stop by my garden today, you'll see Tall goldenrod/Solidago altissima duking it out with New England ex-aster/Symphyotrichum novae-angliae in the sunnier parts of the garden. 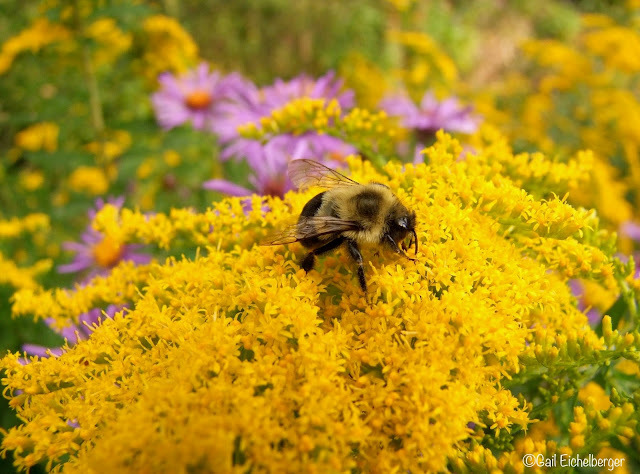 You'll see pollinators, especially bumbles, dancing from aster to aster, goldenrod to goldenrod and back to their nests. All day long. Although, it was the bumbles that led me to wildflowers and gardening for wildlife; it is the hundreds of other critters that visit and live in my garden that keep me committed to planting native wildflowers. Even when those flowers are thuggish! Bumbles, song birds, spiders, flies, beetles, hoverflies, moths, butterfly and ambush bugs will always have Goldenrods to feed on at Clay and Limestone. 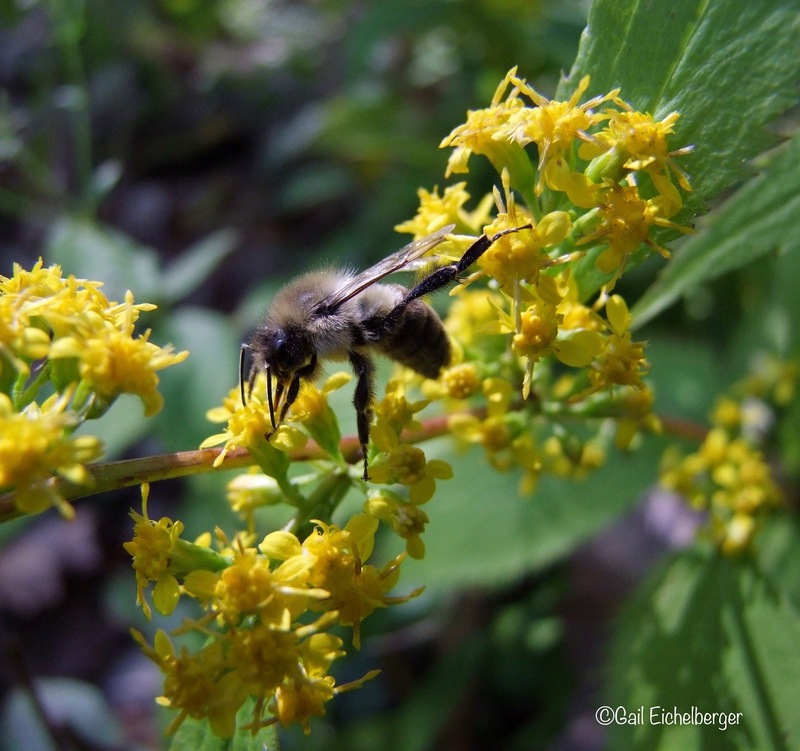 Our native bees rely heavily on collected pollen and nectar found in Goldenrods to provide food for the winter brood's survival. Migrating butterflies stop by for the nectar to help them on their long flight and the seeds are needed by chickadees, finches and pine siskins during the winter. Goldenrods don't scare me! I hope that I've been able to show you that there's much more good than bad in these golden beauties that light up our fall gardens and provide for critters. 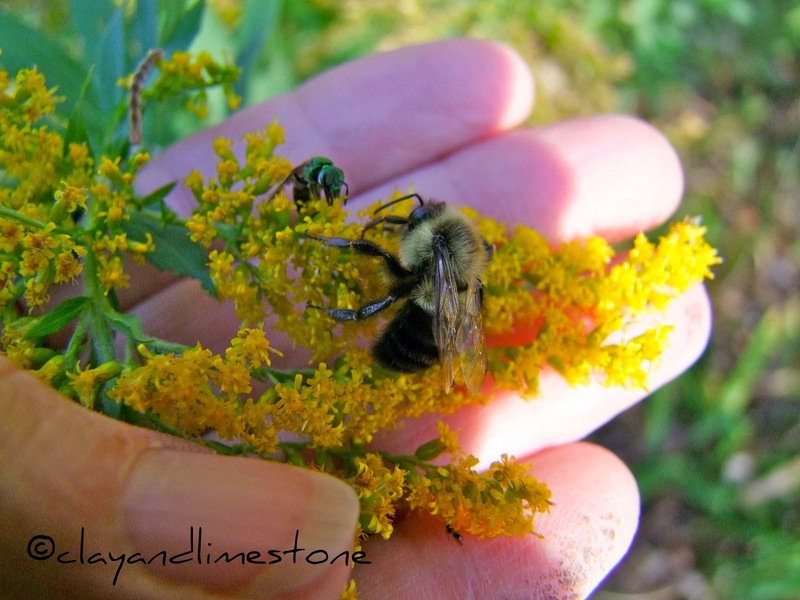 PS If you want to provide for fall pollinators you must plant landing pads of deliciousness like Goldenrods and you must never, ever, ever, ever, ever use pesticides in your garden. I mean never! 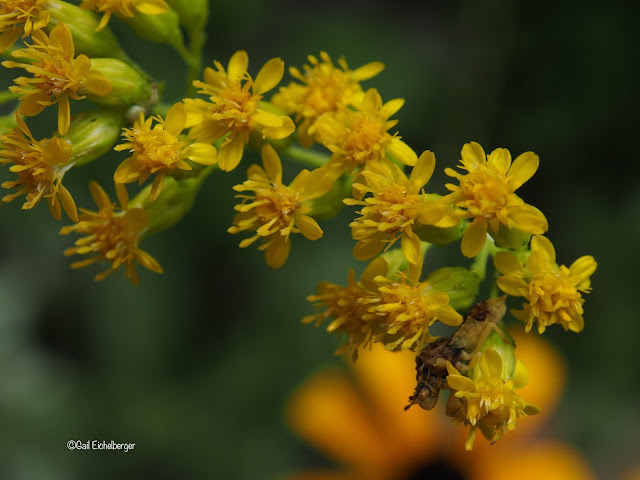 I adore goldenrod and have been meaning to feature it for Wildflower Wed. I will this winter I think. And I do keep it to the meadow as it takes over everywhere I let it....thankfully it pulls out easily. I should try zigzag in the main garden so I can add it among the aster in some of the more wild areas of my back gardens. I love goldenrod. It is the predominant bloomer in wild fields right now. Nothing prettier. Bugs love it too. Golden Rod is lovely and reminds of fall! We had some at work that freaked everyone out because it attracted so many pollinators (bees) it was deemed unsafe for the public. They pulled it and all of the other perennials out and put in some sculptures and gravel. the kids love it, but it's not nearly as cool as all of the goldenrod. I also love goldenrod, and have zigzag in my especially dry shady corner. Our wild Canada goldenrod seems to be particularly lush this year in Toronto. It looks wonderful with the New World "ex-asters." Some goldenrods are garden-worthy and some are better admired in the field. I won't ever let Solidago rugosa (not 'Fireworks') get a foothold in my garden again, but I will try some of the others you mentioned. 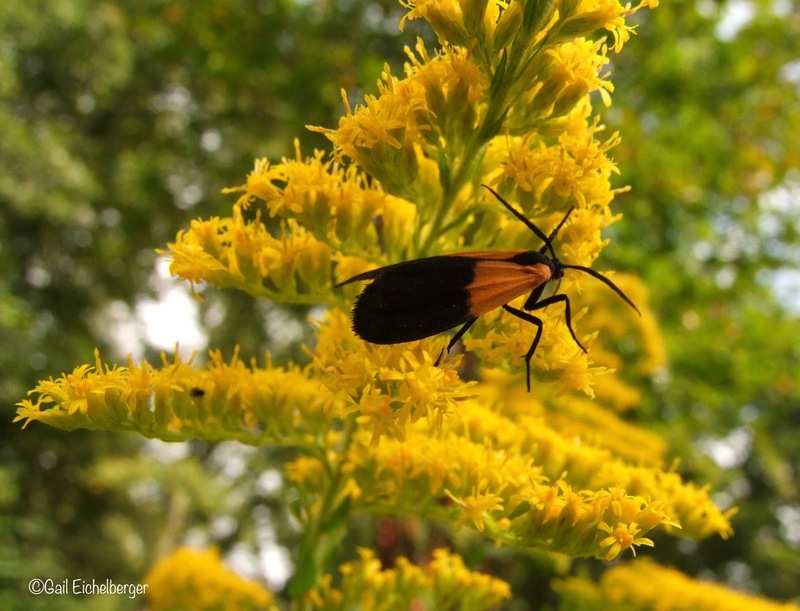 No reason to be afraid of goldenrod as long as you remember: "Right plant, right place." I LOVE this post! And what fantastic pictures! My goldenrod just started to open, so I can't wait for the bee fest to come. Goldenrods are the best. I hope ours are flowering profously! 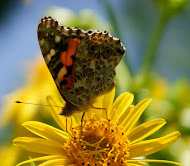 What do you mean by this statement: "Next to oak trees, goldenrods may be the best wildflower for hundreds of insects"? I thought oaks were wind pollinated? Do they also provide benefits for pollinators? Yes, it is time for the goldenrods to do their thing, providing beauty for us, and pollen for the insects. I have not heard of Solidago 'Solar Cascade', Solidago caesia/Bluestem Goldenrod, or Solidago odora. I have what I think is Canada that I need to keep in check, and some of the others you mentioned that don't spread too far here. Beth, the rabbits here eat the liatris, newly planted asters, and purple prairie clovers down to the stubs. I have wire baskets over them, and some, wire cages around them. The bunnies have been able to get through some of them, and because of that, the new Liatris ligulistylis plants are not blooming this year, and are about the same size as when I first planted them. Gail, or others who have zig zag goldenrod, do the leaves of yours get black splotches on them? I have some in the shade, and some that are pretty much in the sun, since a tree across the street was cut down this summer. I LOVE goldenrods. And they are the perfect companion to asters in the fall garden, as far as I'm concerned. In Kansas, I had good luck with Wichita Falls goldenrod, stiff goldenrod (Solidago rigida), and elm-leafed goldenrod (S. ulmifolia) in my garden. The first two did well in full sun; the latter did beautifully in shade. One year - when we had an usually wet August - the elm-leafed goldenrod seeded widely, but otherwise it stayed in neat clumps and brought a beautiful golden glow to otherwise rather dark garden corners. Interestingly, apparently stiff goldenrod is now actually Oligoneuron rigidum and divided into 3 separate subspecies! Here in the Florida panhandle, I'm experimenting with several other goldenrods. I love Bluestem Goldenrod (S. caesia), but find that it needs at least part sun to do well in my sandy soil. Pinebarren goldenrod (S. fistulosa) is thuggish in my garden, but gorgeous in a wild area where it's free to duke it out with its neighbors. It reminds me of Canada goldenrod...but taller and more aggressive. I'm also trying showy goldenrod (S. speciosa) and sweet goldenrod (S. odora); but they are relatively new to my garden and haven't really shown me what they'll do yet. You are singing to the choir here, as I too love Goldenrod. Have lots occurring naturally in my garden. Want to add lots more! I agree that goldenrods are very lovable in the garden and should be planted more often. My only note of caution is that even the clumpers like Bluestem goldenrod can spread aggressively by seed, so some manual control is often needed.